A dog rescue charity working in Shropshire is hoping someone will offer a new home for Honey after she was handed in to rescue to make way for a new baby. Finding Furever Homes, which sponsors kennels near Condover, Shropshire, received Honey recently after her owner found out she was expecting a third child and did not think she could give the dog the time and attention she deserved. Although Finding Furever Homes operates in Shropshire, they are happy to re-home dogs anywhere within the UK, subject to suitable home checks. The charity also asks anyone adopting a dog to commit to being ‘Rescue Ready’ before taking on one of their canine companions. 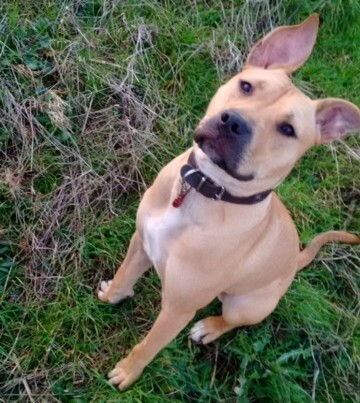 Honey is a two year old Staffordshire Bull Terrier cross breed, good with other dogs, great with children, has excellent recall and great on the lead, clean in the house and non destructive. She was previously adopted from the charity in summer of 2015, and has spent the time since as part of a family with two young children and a cat – a situation which has changed drastically for her since the change in circumstances with her owner. If you think you can offer Honey a home and for further information about Finding Furever Homes please visit http://www.findingfureverhomes.org.uk/.